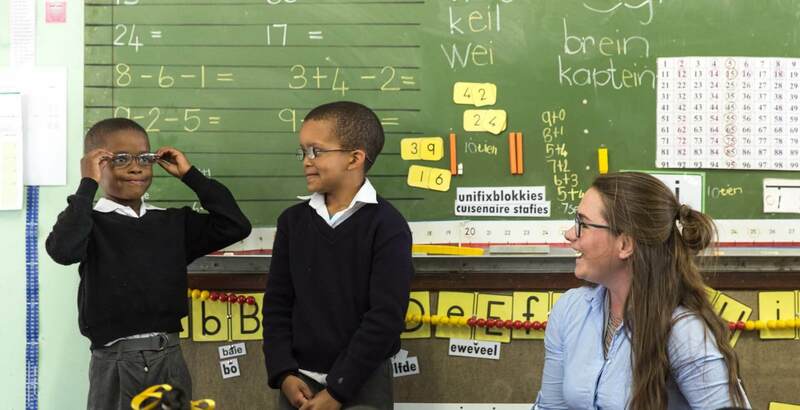 Mobile Schools Health (MSH), a subsidiary of Mobile Specialised Technologies (MST), had the privilege of delivering glasses to two children who were examined at our recent visit to the Vrede en Lust Wine Estate in Franschhoek for the Young Presidents’ Organisation (YPO) Gold education event. During this event, an MSH mobile clinic screened local children from Wemmershoek Primary School to showcase their work to members of the organisation. The glasses were delivered to Jayrin and Logan, two vibrant and friendly youngsters whose happiness and excitement were contagious. While at the school to deliver the glasses, MSH representatives took the opportunity to talk to the school principal, Mr Christopher Boonzaaier and learnt more about the challenges that learners and community members face every day. According to Boonzaaier the closest clinic to the school is at Groendal, approximately 10km away, and a visit there can keep a child out of school for a whole day. This, combined with a range of other factors, make the MSH mobile clinic incredibly valuable for schools such as Wemmershoek. The MSH focus is on preventative healthcare and provides optometry, dental and primary healthcare examinations to children at their schools. This means learners don’t have to miss a day of school for a basic check-up and their parents do not have to miss a day at work to take their children to school. “I think, for now, looking after the main things like eyes, teeth and a general examination, is valuable. If there’s anything wrong it can be found at a very early stage,” says Boonzaaier. YPO representative, Christopher Rolfe explained that events such as the one that took place in September, when the MSH mobile clinic travelled to Vrede en Lust, are designed to increase member learning about the world around them. “Take home value is key, and in this event, in partnership with MSH, we were able to showcase a unique, innovative business solution that is solving real world problems.” Fernando Acafrao, CEO of MST – the holding company of MSH – was also there to explain to members of the YPO how MSH is planning on solving several problems, such as the delivery of medical services to underserved communities, and how members can get involved.